The study also found that human hands harbour far higher numbers of bacteria species than previously thought. Using powerful gene sequencing techniques, researchers found a typical hand had roughly 150 different species of bacteria living on it. The Proceedings of the National Academy of Sciences study found bacteria types varied greatly between individuals. The researchers, from the University of Colorado at Boulder, hope their work will help scientists to establish a "healthy baseline" of bacteria species on the human hand. This could potentially help them to identify which species are linked to specific diseases. Lead researcher Dr Noah Fierer said: "The sheer number of bacteria species detected on the hands of the study participants was a big surprise, and so was the greater diversity of bacteria we found on the hands of women." The study detected and identified more than 4,700 different bacteria species across 102 human hands in the study. However, only five species were shared among all 51 participants. Even the right and left palms of the same individual shared an average of only 17% of the same bacteria types. On average, women had 50% more bacterial species on their hands than men. Dr Fierer said that the higher bacterial diversity on women's hands may be due to the fact that men tend to have more acidic skin, which provides a more harsh living environment for the microscopic bugs. Alternatively, differences in sweat, oil gland or hormone production may be key - or the fact that women and men tend to make different use of cosmetics such as moisturisers. Dr Fierer said the study also found hand washing had little impact on the diversity of bacteria found on an individual's hands. While some groups of bacteria were less abundant following hand washing, others were more abundant. However, the researchers said that washing with anti-bacterial cleansers was still an effective way to minimise the risk of disease, as it seemed particularly to target harmful bugs. 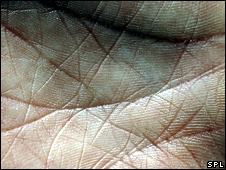 The diversity of bacteria types on the palm was three times higher than that found on the forearm and elbow and appeared to outstrip that found in the mouth and lower intestine. Dr Fierer said: "We know that skin associated bacteria are likely to have an important influence on skin health, a minority may act as pathogens and many may actually have a beneficial effect, protecting us from disease. "However, we do not know how differences in bacterial communities may impact skin health and we do not know if specific types of bacteria are more beneficial than others. "This is an active area of research but our results suggest that answering these questions will be very difficult given that there is so much background variability in bacterial communities between healthy individuals." Dr Valerie Curtis, director of the Hygiene Centre at the London School of Hygiene and Tropical Medicine, said science still had much to learn about how bacteria interact with the human body. She said: "Most are likely to be neutral, just living there without doing any harm or good." But she added: "It is thought that having such flora on our hands is probably beneficial, because the bacteria occupy niches which are then unavailable to pathogens."